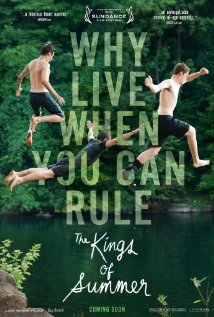 I’ve been hearing a ton of buzz on Kings Of Summer, and it’s one of those movies that from the title, the quotes I’d seen, and thumbnails I’d just flat gotten the wrong impression on what kind of movie it is. Where I expected some kind of wry, dramatic thing about kids growing up, this is more like an outright raunchy comedy, starring people like Alison Brie, Megan Mullally, and Nick Offerman doing his thing, while a trio of young new comedy guys have fun in the woods. It’s definitely a different vibe from Superbad, but it brings that film to mind and makes me wonder if we will similarly see the trio of Nick Robinson, Gabriel Basso, and Moises Arias filter their way into the comedy ranks? The film, from director Jordan Vogt-Roberts, hits some amount of theaters on May 31st.